So wait, just because they don't have a black or asian person in the family they're from the middle ages? Does that mean my family is? Or the millions of other families who don't have interacial families? If your family block it, as the Royal Family do, then you are, unfortunately. 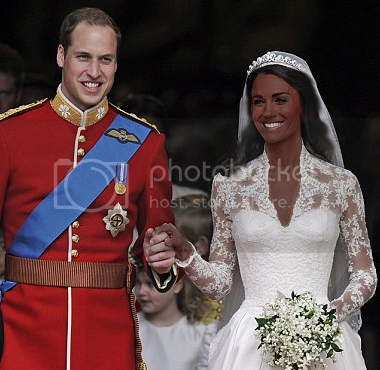 ewwwwwwwwwwwwww a black woman as a royal?? If your family block it, as the Royal Family do. How can you say that? Theres no evidence at all to support that claim! It's an interesting question, but not one we can actually answer with any degree of validity. Even if they were against it, they would never make such opinions public, well Philip might, but the rest wouldn't. I'd like to think William is above petty racism, but it is true that the Royals are expected to marry from the proper social class, where there are very few blacks or asians or arabs, at least here in the UK. Seeing as William and Harry do not have to marry for peace treaties, etc. they do not need to look abroad for a prospective partner, so they are rather limited in whom they can choose. Race may play a factor, we will never really know, but social class is really what decides whom they marry. For some reason, I don't think they would've met if she was black. Of course we don't block it or oppose it, I nearly dated someone who was black, but then he moved away. But then you couldn't really determine the royal families attitude until it happened, if it did I wouldn't worry about the royal family, I'd expect the public to have a much louder and critical opinion, everyone made such a fuss over the fact Kate was middle class, let alone of her skin colour. We are not, they still are, at least racially. Given how multicultural British society is nowadays, there would be a storm if the Queen had stepped in and said no. And besides, he should be allowed to marry whoever he wants. That's the thing, it may never happen as it most probably is not allowed to. Surely if you think the Royal Family is racist enough to prevent a non-white person from marrying Prince William, he himself would probably be racist enough never to enter into a relationship with her? After all, he's been brought up in that environment. Of course. You just never hear the truth because the Royal Family are good at PR. Erm, isn't the Queen German and her husband Greek? For all we know, they're probably related to Hitler! You completely failed to grasp what I said. But, in the modern world shes no more important than anybody. What power does she have to call on? Metaphorically, shes pretend to steer a ship that actually steers itself..
Erm, isn't the Queen German and her husband Greek? If I was Kate I wouldn't upset her and i'd wear a seatbelt all the time.